Are you looking for a product that will help you get much cleaner air to breathe around your home? You don’t want to settle for just any old air cleaner either if you truly want to breathe healthier air in your house. We suggest you use a model air cleaner that cleans the contaminants out of the air in your home in more than one way. That is exactly what we heard the Winix PlasmaWave 5300 Air Cleaner does. Read along with us as we take an up-close look at this multi-dimensional air cleaning product. This air cleaner from Winix can help purify the air in areas up to 350 square feet. That is enough air cleaning power to handle even the largest size rooms. Imagine still having clean air to breathe in your home even while you are entertaining many guests that smoke or if you have a house full of pets. 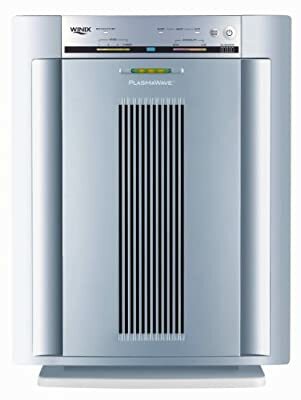 The Winix PlasmaWave 5300 Air Cleaner uses a unique 3-stage approach to cleaning the air of the rooms it’s placed in. It removes a huge amount of pollen, pet dander, dust and other contaminants from the air you breathe in your home. It even has a built-in air sensor to let you know how the air quality currently is in the room it’s placed in. You will like the looks of this Winix air cleaner too. This model air cleaner looks more like an expensive piece of Hi-Fi stereo equipment than it does an air purification system. It has a simulated brushed metal finish and easy to work push-button controls. Even the lighting on it is subtle and looks good. By far this model air cleaner’s best feature is the triple action air purification and filter system it uses. It does a great job attacking the contaminants found in your household air. The Winix PlasmaWave 5300 is a very effective and well-rounded air cleaner, to say the least. These pre-filter does two nice things for this air purifier’s advanced air cleaning system. The first is that it traps most of the larger size air contaminants that pass through it. That lessens the cleaning burden on your HEPA filter that is in this air cleaning system too. It can even be removed and easily cleaned too. The other nice characteristic of this air cleaner’s pre-filter is that it has activated carbon in it. Activated carbon has a large amount of surface that will absorb smoke and other odor-causing air contaminants. HEPA Filters are popular on all sorts of air cleaning devices. That’s because they filter out such a high amount of contaminants from the air you breathe in your home. They can eliminate as much as 99.7% of the harmful contaminants in your home’s air. That means fewer allergens, dust, and pollen for you and your family to breathe. This is a Winix proprietary technology that generates free negative and positive ions. These react with the contaminants in the air in your home on a molecular level. They will break up such things as odor-causing smoke molecules, vapors, allergens and many other common indoor pollutants. It will also make them larger so your filters can catch them more effectively too. This technology accomplishes this without any negative side effects too. We have to say the Winix PlasmaWave 5300 Air Cleaner gets a big thumb up from those of us here. There simply was much to like about it. Everything from its good looks to its large 350 square foot air cleaning capacity was impressive. When you factor in its advanced 3-stage air cleaning system it’s a model air cleaner that is really tough to beat for the price you will pay for it. It’s definitely a product to highly consider if you are looking for a new large room air cleaner.